When I made arancini the first time, Corina mentioned that she had baked hers when she made them. As I moderate my comments, both Kathryn and Mary Frances had not seen Corina’s comment, nor had they seen each others’ asking if these could be baked. I am always up for a challenge, and decided to try and make baked arancini stuffed with cheese as part of a meal. On the Friday afternoon before I made these I went shopping with my friend Nadia. We were browsing the aisles for snack food and when I saw the vegetable crisps I decided to buy them to use for this recipe instead of making them. This was a short cut I was willing to take as I know how long it takes to form the arancini. The nice thing with baking them is that you don’t have to stand over a deep fryer and watch them or indeed fry them in batches. I loved the crunchy exterior and the gooey interior and would make these again for sure. Tandy, I’m having trouble leaving comments the last couple of days on your blog – sorry if this one comes up twice! I adore arancini, and especially love that first cheesy photo – how nice that these are baked! interesting idea to bake the arancini, i’ve only ever made & eaten fried ones! i think i definitely need to give the baking method a go.. probably so much healthier without all the deep fried oil too! thanks for sharing the idea tandy. This dish has everything that I’ve ever dreamed of! Mozzie cheese never goes wrong! Ryan and I first had arancini on our honeymoon. He loved it, and now I can recreate it at home! Tandy I have never made arancini, but yours look so good I must add this to my repertoire! Great recipe, thanks so much for sharing. Seems like baking worked incredibly well with these arancini! 🙂 I’m not a huge fan of frying, because of the mess/cleaning up etc, so I love it when things can be baked instead AND they turn out just as good! Love hwo you used vegetable crisps too- they look really crunchy and yummy! Thanks Von, baking these was a winner! Hi Tandy, I tried my hand at these a few months ago with disappointing results, will try your version, they look much lighter. I’ve never baked them either – time to change that as they look amazing! Drooling over that oozing cheese! THese look awesome. I am always interested to read about new baked treats and love the fact that you have crushed vegetable crisps for the outer shell. Great idea. I made arrancini a few months ago for the first time, Tandy, and I was blown over by how delicious they were. It’s a wonderful idea to make them a little lighter. I love those veggie chips! it’s must be less calories than the deep fried ones! That is the best compliment! 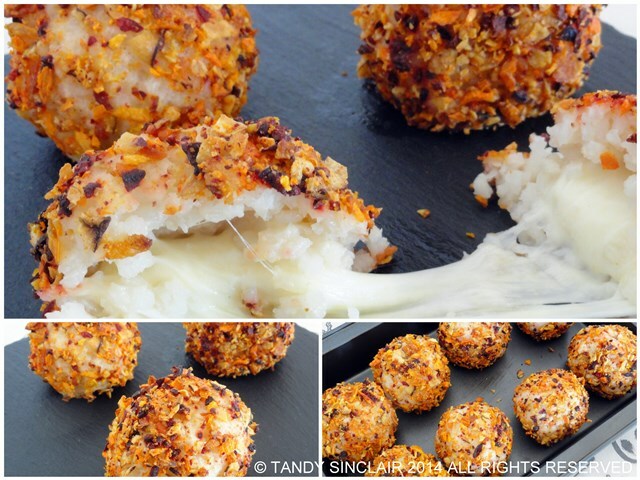 Oh, yum, Tandy – I love Arancini and baking them is a great alternative – I don’t like deep-frying much (sure I like deep-fried food, but prefer not to do it myself, besides better if baked), also love the idea of using vegetable crisps as the coating. I love your idea of using crisps instead of breadcrumbs – and thanks for mentioning me too.